A graduate student at Eastern New Mexico University recreated a portion of the prehistoric landscape at the famous Blackwater Draw Locality 1 archaeological site. Jasmine Kidwell’s goal was to better understand climate conditions that may have impacted the Paleo-Indian occupants of this region during the onset of the Younger Dryas, an abrupt return to near-glacial conditions. 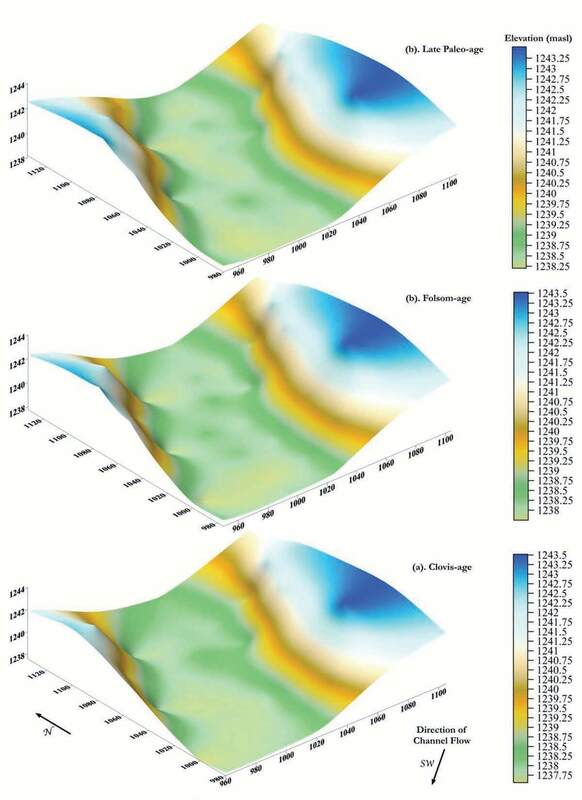 As part of her graduate thesis, Kidwell used Surfer to visualize the subsurface terrain during three cultural periods when Paleo-Indian people occupied the area by mapping core hole deposits. “As archaeologists, we want to do as minimal amount of invasive destruction as possible,” said Kidwell, explaining that Surfer mapped the buried landscapes in detail that could have only been accomplished otherwise by excavating the site. This site is known as Blackwater Locality No. 1, the Clovis type-site for North America located near Clovis, N.M., where the first artifacts of the Clovis culture were found in direct association with extinct Pleistocene megafauna. The now well-known Clovis fluted points indicated that people hunted mammoth and other megafauna in the region over 13,000 years ago. But questions linger as to what type of environmental conditions impacted the occupants of this region as the climate fluctuated. Some archaeologists believe the answer lies in the site’s buried outlet channel, which flowed from a shallow lake into Blackwater Draw proper during the Clovis, Folsom and later Paleo-Indian periods. What caused the ponding of the lake at Blackwater Draw Locality 1 during the onset of the Younger Dryas? That’s the question Kidwell sought to answer by hand-auguring 36 core holes, each reaching five to seven meters below the modern surface to reach the outlet channel deposits from those three periods. The stratigraphic boundaries were differentiated by sediment color, texture, and content, allowing Kidwell to record X, Y and Z coordinates for the top of each stratigraphic unit in the core holes which spread across the channel. She input the coordinates into Surfer and generated contour maps representing the paleo-landscapes during the Clovis, Folsom and later Paleo-Indian periods to determine how the outlet channel geomorphology evolved over time. “Archaeologist wonder what may have caused the ponding of the lake and possible blockage within the outlet channel,” said Kidwell. She explained that some believe the channel may have been blocked by gradual alluvial infilling of sediment or perhaps shifting sand dunes moved into the channel. It’s also possible the channel was blocked by a sill serving as a sediment trap, or even a beaver dam. The potential cause would reflect a different depositional environment and climatic factors contributing to changes in the outlet channel. This reduction in channel flow that once fed Blackwater Draw occurred throughout the Paleo-Indian occupation and the Younger Dryas, according to the contour maps. Kidwell’s results support the hypothesis that the Younger Dryas brought about increasingly dry conditions at Blackwater Draw Locality 1. Kidwell learned to use Surfer in a structural geology class, and she said the geomorphologic mapping technique she used where stratigraphic data is derived from core holes is common in archaeology. Surfer is a popular package among archaeologists for this reason. Kidwell is now working on creating an animated sequence in Surfer’s 3D View to show the channel’s changing geomorphology over time for display at the Blackwater Draw National Historic Landmark and Museum. Models of the Blackwater Draw Locality 1 outlet channel depicting the (a) Clovis-, (b) Folsom-, and (c) Late Paleoindian-age channel geomorphology. Channel flow is to the southwest. View is northeast towards what would be the prehistoric lake. X, Y, and Z axes are in meters. Image created by Jasmine Kidwell.